We would all love to go on a garden tour to the Royal Botanical Garden at Kew, in England, or the Butchart Gardens in Victoria B.C., but why not look closer to home? 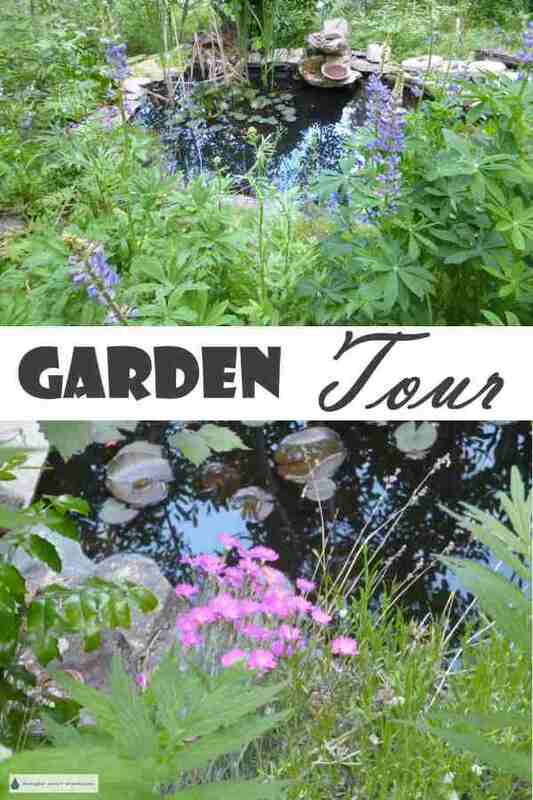 When you come on a garden tour at Blue Fox Farm, here are a few things you’ll see. First of all when you drive into the driveway, there is a hand built rock retaining wall planted along the top with Sedum stock plants of over forty varieties and species, and Sempervivum growing out of the wall itself. This has turned out to be the best place to view bees and butterflies - a surprise butterfly garden planted with some of the best plants for bees. There is sedimentary red shale, grey speckled granite, white water rounded granite, metamorphic rock sometimes with fossils of leaves in and many other types. The native sandy soil was mixed with steer manure and the many types of Sedum were planted in groups of three to five plants. Lava rock is used as mulch, partly for the beautiful red colour, and also for the benefit of moisture retention, weed control and the tiny amount of nutrients released from the rock every time it rains. For xeriscaping, this is the finest of all mulch materials. Next is the old green wheelbarrow filled with rare and precious Jovibarba is a focal point. I love using rustic salvage to decorate my garden and give new life to old junk. The garden tour continues with views of the green roof of the Japanese Tea House, a tiny shed used for storing firewood for the outside fire. The green roof is planted with over thirty kinds of green roof Sedum, and a few Sempervivum. Then we closely inspect the thick cordwood walls of Glory Be, the root cellar – earth sheltered and used for storage of winter root vegetables, pickles, wine and many seldom used kitchen items. A 60watt light bulb keeps it from freezing in the winter. Embellished with another green roof, this was a test to see how to construct this type of structure. The Livery is the woodshed built to house and season firewood for the winter heating season. Our home is solely heated by an airtight wood burning heater. The Livery can hold almost eight cords of wood, more than we can burn in a winter. The Circle of Thyme Chapel of St. Frances of Assisi is the twig gazebo built at the edge of the ha-ha, a drop off to deter deer from visiting the garden. The Chapel is planted with many Clematis, both the native variety and seed grown Clematis macropetala. The Mercantile, flanked by the water capture system with a hand pump for filling watering cans is next. The Mercantile is the power shack, complete with room for a freezer, storage, phone line and recreation vehicle hookup. The Eggporeum houses the Bantam chickens with a wire run to put the chicken pen compost in for processing. In the Eggporeum, the rich nutrient rich deep litter is processed and turned many times by the chickens. The Bantam chickens aren’t just decorative, they provide little miniature eggs as well as being compost turners. I didn’t realize it was so magnificent, as I’m so used to it. The terraces built of native rock cascade down the hill, filled with Drought Smart Plants of all kinds. I grow perennials mostly, along with a few shrubs that are chosen for their insect and bird attracting properties. A tiny orchard with five apple trees and four cherry bushes curves around a mixed perennial bed with Lavendula, Hyssopus, many border Sedum and other hardy dry garden plants. The Sedum tapestry garden curves around the archway with a Picea pendula and Lonicera trained over it. The beds are filled with many spring flowering bulbs, magnificent in early spring. The ecosystem pond is planted with marginal plants such as Caltha palustris, Iris sibirica ‘Caesars Brother’, Salix koryinagi ‘Rubykins’, Salix brachycarpa ‘Blue Fox’, Juncus species, Carex ‘The Beatles’, Carex pendula and Nymphaea planted right in the mud of the pond bottom. Oxygenating plants clean the water and provide the gold fish and mystery snails with oxygen. Once a year, the oxygenator plants are torn loose to go onto the compost pile. Salamanders, snakes, frogs and lizards visit and help keep the pests at bay. Many birds use the little waterfall to bathe and drink, and bring their youngsters to school them in the intricacies of bird hygiene. Our garden tour takes in the organic and sustainable vegetable garden providing garlic, onions, potatoes, summer squash, peas, beans, lettuce and other greens, herbs, peppers and tomatoes, as well as alfalfa for mulching. Learn more about the organic garden on my other site, O-Garden. The greenhouse, the final stop on the garden tour, is where all the propagation happens, and the rustic twig and barnboard crafts are born. Blue Fox Farm has more on that part of the operation. Hypertufa projects are created there too. I spend time in the fall painting barnboard signs; this is also where Sedum and thyme are propagated in plug flats during the summer, and orders are dried off before being packaged for shipping in the mail. I hope you’ve enjoyed your virtual garden tour of my nursery. See you next Thyme! To have a real garden tour of my nursery and demonstration garden, please contact me directly. There is no cost for a personal garden tour; please allow several days notice. Sorry, limited parking, so no buses please. Visit the Garden Gallery; see the pretty plants that shine in June in my xeric display gardens. The Garden at Son Ranch Timber Co.